I've have been very fortunate to have developed a partnership with Bouder Mechanical Services for all our installation and maintenance services ... They have always come through with impeccable work and professional knowledgeable advice that has helped us with all our challenges. I really do not know why you would use anyone else, we don’t !" Installation of Truck Level on-site. 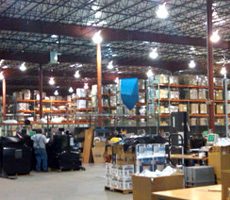 Thank you for your excellent ... team effort, once again, with the recent Autoquip project in Washington, DC... [coordinating] equipment trucks, cranes ... post 9/11 security maze can be very challenging on a Federal Government job site... we [completed the project]... with a one-day completion... as promised. It is a great working relationship we’ve enjoyed since 2002. " [Their] skills are rated first class in performing those needs we have called upon [them] to accomplish in the past ten years ... I’d hire or recommend service personnel to work on our equipment from coast to coast ... [they are] the very best." 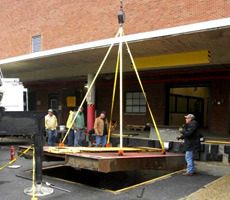 [We’ve] been using Bouder Mechanical Services for the past 10 years for material lift installations in PA, DC, VA, and MD. [They are] ... very reliable and thorough with all projects ... knowledgeable regarding permits, inspections, drop tests ... [and] we will continue to use [them] for many jobs in the future." Operation[s] not only maintains a high level of quality, but ... an emphasis on safety ... showed all ability to meet deadlines placed before [them]." We are proud to have Bouder Mechanical Services located in, Lancaster, PA. as an authorized Sales and Service dealer for our full line of products. Our relationship with Bouder Mechanical Services has been very enjoyable and successful for over 10 years."